Enrollment is filling up fast! Register today to save a spot! Liberty Camp 2019 is on July 15-19. Registration is open! Please view our current flyer. SECOND: Open and read/or print the PreCamp Letter. This provides information about what to expect the first day of camp, where to drop off your camper/s, how to sign them out at the end of the morning, and how to prepare them for their living history experience. You may request hard copies of both at LibertyCampForKids@att.net or call Anne at 440-227-1210. Thank you for selecting Liberty Camp For Kids for your family. We look forward to serving you. Adult Volunteers Join us in any capacity you wish to participate. Part time and full time volunteers welcome. For more information, please view the Volunteer Tab in upper right. LibertyCampForKids@att.net or call Anne at 440-227-1210. 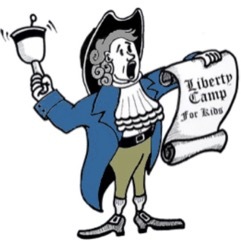 Liberty Camp For Kids has recently become a 501(c)(3) organization. Donations are tax deductible. Please consider donating.